Did Chris Redfern engineer Kucinich’s exit from Congress? The Dennis and Marcy primary saga continues. First, a look at Kucinich’s and Kaptur’s districts as they stand today, before redistricting. Dennis’s 10th comprises most of western Cuyahoga county. Marcy, in the 9th, represents most of Lucas County (including Toledo), all of Ottawa and Erie Counties, and western and southern Lorain County where I live. We knew that we were going to lose 2 seats in Congress, and the speculation began as to which seats would be drawn together to condense the map from 18 districts to 16. It was widely anticipated that Dennis would be eliminated by the Republican majority. But in September, when we first saw the new map, it looked like the one below. Both Kucinich’s and Kaptur’s seats had been drawn together, and Dennis was elated that he kept a large portion of his most loyal support. We have a district! The race is on! In a stunning development, the redistricting gave most of the Republican part of my old district to three incumbent Republican congressmen and left most of the Democratic part of my district intact. What happened next is that the Ohio Democratic Party stomped their feet and threatened to put the map to a voter referendum, which would’ve put the map on hold. You can read the entire history here, but in the end, the map below is what was finalized in December. What happened was that while Republicans were negotiating to alter the map to get enough Democrats aboard, the new 9th was changed, and the advantage swung back to Marcy Kaptur. The Toledo Blade has some good analysis of the district here. Dennis, of course, was not happy about this. Check out what he said even before the redrawn map was made public. He knew who to blame: his fellow Democrats in the statehouse. In the past week a mind-boggling number of re-mapping efforts by Democrats in the Ohio General Assembly have been made to try to reshape our district in such a way as to dilute the strength of my core constituency in Cleveland, Cuyahoga County. Yes, the Republicans drew a Democratic district, using most of my present district and creating a seat which is based in the Cleveland area. This map gave the advantage to my constituents in the greater Cleveland area. I have said so. Some statehouse Democrats want to repeal this map. I don’t. Then, this past Saturday, Brent Larkin of the Plain Dealer dropped a bombshell. He says Ohio Democratic Party Chairman Chris Redfern orchestrated the change. Why would he do this? Because he has his eye on the seat for the eventual day that Kaptur retires, and wanted to shift the influence of the district back towards Northwest Ohio, his home base. Part of what happened is Kucinich got mugged by his own party chair. Four people with firsthand knowledge of what transpired, but who declined to be identified for fear of retribution, fingered Ohio Democratic Party Chairman Chris Redfern as a key proponent of changing the boundaries to benefit Kaptur. The change makes it likely that much of Greater Cleveland, the foundation of the state’s Democratic base, will be represented in Congress for the next decade by someone who resides in western Ohio. Redfern did not return a phone call. But both he and State Rep. Matt Szollosi, the assistant House minority leader, live in Northwest Ohio and are believed to covet Kaptur’s seat in Congress when she leaves it. Szollosi voted for the map that shifted votes to Northwest Ohio. Did Dennis really get thrown under the pirate ship by the ODP Chairman? 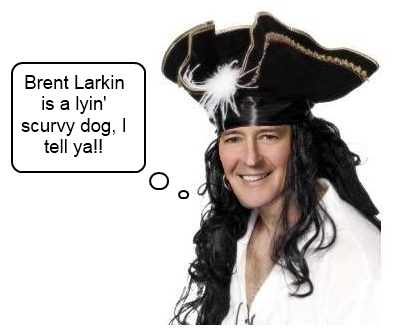 Redfern says Larkin is a liar. Other facts tend to back up Larkin’s story, though. He is running for the Ohio House in his Northwest Ohio district. He is relatively young, and could spend quite a few years building a power base from the Ohio House while he waits for Marcy to finally retire. On the flip side, however, Kaptur has given no indication she will retire any time soon. She has been in Congress a LONG time, and soon could be her party’s ranking member on the powerful Appropriations committee, making her chairman if the Dems ever took back the majority. That’s not something someone gives up lightly. Don’t count Dennis out, though. He has pulled out tough wins before in his career. One thing is for sure. Joe the Plumber and the other Republicans are wasting their time. No Republican will ever hold this seat. But the Kaptur/Kucinich battle will be one more fun thing to watch on primary night.